Is your dishwasher not cleaning your dishes? What’s the point of having a dishwasher if you have to clean the dishes yourself after they come out the dishwasher? Fortunately this dishwasher repair guide will guide you in repairing your dishwasher. These are the same steps I take in repairing dishwashers professionally. So read each section carefully until your dishwasher is repaired. Before you start working on your dishwasher, there is one thing you should know. Dishwashers will not clean dishes unless your hot water is at least 130 degrees Fahrenheit. I know most owners manuals say 120 degrees but I know from experience that 130 degrees is much better. So if your dishwasher is not cleaning your dishes and your hot water is less than 130 degrees click here for instructions on how to turn your hot water heater up. If your dishwasher is not cleaning then it may not be getting water. If no water is getting in your dishwasher, your problem can be the dishwasher water valve, float switch or your house plumbing. To check to see if your dishwasher is getting water first, turn the washer on. Then wait; it can take a few minutes for it to reach the fill cycle. Then open the door. If there is no water, continue reading this section, if there is water skip to wash arm. Water levels on dishwashers can vary but typically it will be one to three inches of water in the bottom of the tub depending on the model. First make sure the water is turned on to your dishwasher (I have been on service calls because the water was turned off). Now restart dishwasher, put your finger on the water valve (do not touch the wires!!!!) and wait. When the dishwasher reaches the fill cycle, you should feel a vibration on the water valve. If you do feel the vibration and no water enters the washer, replace the water valve. Feeling the valve for vibrations works most of the time but if you want to be %100 sure you must test with a voltage tester. Disconnect power to the diswasher and unplug the water valve. Then insert the leads of the voltage tester into the plug of the water valve. Make sure they are in good and making contact with the wires and make sure the wires are not touching anything to make it short out. Then reconnect power and start the dishwasher and watch the voltage tester. If you get voltage replace the valve and if not you may have a bad float or float switch, read on. If you never feel the vibration or determine that the valve isn’t getting voltage open the door, in one of the front corners there will be a float. Remove the cover off the float and make sure the float is free to move up and down. Sometimes soap will build up around the float causing it to stick. If this happens clean off the soap and reinstall the float you and problem should be fixed. Now if the float is free to move up and down the switch may be your problem. The easiest way to check this is to move the float up and down. Each time you do so you should hear a faint clicking noise, but just to be sure this is how you check the switch. First disconnect power from your dishwasher. Then remove the wires from the switch. Then using your ohmmeter , check continuity between the two terminals while the float is in down. If you don’t have continuity, the switch is bad and needs replacing. If you do, the switch is ok your problem is elsewhere. Water valves can be purchased at AppliancePartsPros.com. If your dishwasher is not cleaning, your wash arm may be broken or not turning. To check to see if your wash arm is turning, perform this test. First start your dishwasher and make sure water enters. Wait until the water is finished running then open the door and note the position of the wash arm (remove bottom rack for better view). Now close the door for 10 seconds or so, then open the door. 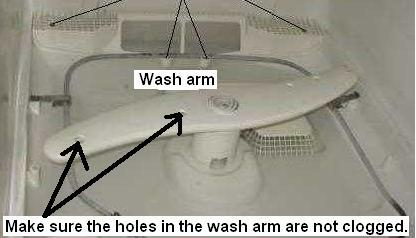 The wash arm should be in a different position and on some models you may still see the wash arm turning. Repeat this a few times to be sure. Now if the wash doesn’t seem to be turning there are a few things that can cause this. First check to see if the holes in the wash arm are stopped up. If they are, clean them out and your problem should be fixed. If not, check to see if the wash arm spins freely. If it doesn’t spin freely, replace the wash arm and any bearings that the wash arm spins on. These parts can be purchased at AppliancePartsPros.com. If you dishwasher is not cleaning, it may not be draining properly; therefore, cleaning with dirty water. To check, this first start the dishwasher and wait until the entire cycle is done. Then open the door and if you see water standing in the bottom of the tub the dishwasher is not draining. Click here to learn more about your dishwasher not draining.